Like the previous Battle facilities, the Battle Maison includes the special Multi Battle mode. Here, you can participate in Double Battles against two trainers, selecting two of your Pokémon. When you begin, you first get asked if you wish to do this with a friend. This is done via local connections, starting with utilising the 3DS IR and allows for you to both challenge it at the same time. Your streak is reset if you do this. However, if you don't wish to play with a friend locally, you can play with an AI player. These AI players include yourself, Shauna, Tierno and Trevor, as well as everyone on your Friend's List. 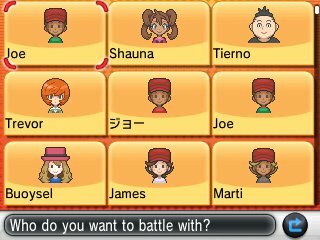 Each person is represented by a "friend" of the player and will have two Pokémon. You are shown the Pokémon they have before you select them, so you can make sure to make the correct choice.